Radio Edit 3:07 Back Again 541 / N.E.W.S. 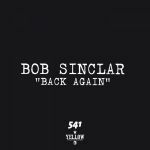 Original Mix 5:30 Back Again 541 / N.E.W.S. 3:35 DH Radio Clubbin' Party 2014 Vol. 2 [Mixed & Selected by Benoit de Neco] 541 / N.E.W.S.